"A sane...high-end product, one that takes no deep pockets to buy, and no flowery language to understand and appreciate." Among the crimes that Madison Avenue has committed against society is the watering down of language, specifically the meanings of certain words that just happen to have unique utility in advertising. We have amazing apples, fabulous flooring, and extraordinary earrings, and because of this, nothing that's truly amazing, fabulous or extraordinary gets the acclaim it deserves. Consumers have built-in filters for advertising, it is true, but these only make the problem worse, as advertisers have to try ever harder to catch the attention of the buying public. Just have a look at a Victoria's Secret catalog for an idea of the lengths to which advertising will go -- and where it is still headed. What do words losing their meanings and Victoria's Secret have to do with Magnepan? I could make a joke about the meager lingerie needs in Magnepan's icy hometown of White Bear Lake, Minnesota, but doing so would only obscure the point of this follow-up review: that the Magnepan MG3.6/R has reached a unique place in the audio world, the status of a classic, even if such standing doesn't have the prestige today that it should. Introduced in early 1998, the MG3.6/R has been widely written about, including as the subject of Andrew Chasin's 2002 SoundStage! review. It's a three-way, full-range dipole speaker that uses two of Magnepan's patented planar-magnetic drivers -- 500 square inches in area for the bass, 199 square inches for the midrange -- along with the company's 55" true-ribbon tweeter. The speaker requires some assembly due to its external crossover and metal support feet, but once set up, it looks distinctive and attractive -- like an unadorned panel from a Japanese screen. All of this -- the esoteric drivers, the unusual form factor -- are part of MG3.6/R's allure. This speaker has an undeniable coolness about it; it is the speaker that Frank Lloyd Wright might have owned. Another thing that makes the MG3.6/R appealing is its price. 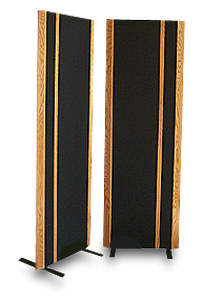 When the speakers were introduced, they cost $3750 per pair; six years later, they cost $4200 per pair, an increase of slightly over 10%. Exotic design and looks aside, these speakers represent honest value. You don't see any planar-magnetic/ribbon speakers coming from Asia, but if there were, Magneplanars would be competitive in terms of price and certainly built to higher standards. This also underscores the exclusivity that the MG3.6/Rs, and indeed all Maggies, possess. Who is making speakers like them? No one. Earlier this year I got to hear Magnepan's top speaker, the MG20.1/R, for the first time. That demo made a lasting impression on me, and started me thinking about the MG3.6/Rs, which occupy an interesting place in Magnepan's product line. The MG3.6/Rs are tantalizingly close in size and technology to the MG20.1/Rs, but only about one-third the price. On the other end of the scale, the MG3.6/Rs are also an obvious upgrade for owners of the less-expensive MG1.6/QRs, the pull of Magnepan's ribbon tweeter, which the MG1.6/QRs don't have, being more than magnetic. Thus the notion exists that the MG3.6/R is a large slice of the best that Magnepan offers, but at a price that's in the middle of the speaker pack. All of these peripheral considerations aside, the MG3.6/R is one fine speaker -- the best sub-$10,000 speaker I've heard. So much of its sonic aptitude boils down to the clarity with which it reproduces music throughout its entire range. I've come to associate even the best speakers that use ribbon tweeters, often smallish OEM drivers, with hard, splashy highs that "tizz" even when a brush lightly caresses a cymbal. Not the nearly five-foot-long Magnepan true ribbon. I have heard the MG3.6/R's treble sound hard at shows, but I can say with complete confidence that this is due to the partnering electronics, not the tweeter itself. Driven by Lamm M1.2 Reference amps (a great pairing, by the way), the ribbon's pure, filigreed sound is a revelation. Such extreme high-frequency detail is something listeners usually pay for with fatigue, but not with the MG3.6/Rs and a very good amp. Treble speed, air and delicacy are consummate, but not overblown in order to achieve such performance. Taken on its own, the Magnepan ribbon is the very best tweeter I've heard. That the planar-magnetic panels keep up with such a fast tweeter is a feat. The panels continue the MG3.6/R's clarity through the mids and into the bass. The MG3.6/R starts and stops in binary fashion. It is seemingly either reproducing the music, without blurring or overhang, or it is not. Each note takes only its space in time and nothing more. As you can guess, this makes even some of the best speakers sound a little blurry and imprecise, and the MG3.6/R does its thing without any tricks -- no goosing of any region to impart an unnatural sense of resolution. The bass takes some time to come around, but it will never have wall-flexing power. It sounds light and stiff at first, but with 50 hours or so of use on the speakers, bloom and weight begin to show up. I know some listeners mate the MG3.6/Rs with a subwoofer, but I wouldn't do it. It's very easy to accept what this speaker does without worrying about what it doesn't do. Among the various factions in high-end audio, Magnepan owners are some of the most knowledgeable and sensible audiophiles around. They learn about their speakers. Some can fix minor problems with the panels when they occur, and others have built custom crossovers. They all generally accept the idea that audio is about music, not about continuously building an audio system. Their extreme loyalty to the Magnepan brand adds to the charm of the company's speakers; Maggie owners often keep their speakers long enough that they wear out and have to be repaired -- an unusual concept with consumer-electronics products these days. As a group, secondhand Maggies have value beyond that of any audio products other than vintage McIntosh gear. The audio world certainly has its share of wackiness, but Magnepan isn't adding to it. Above all, the MG3.6/R is a sane (albeit uncommon) high-end product, one that takes no deep pockets to buy, and no flowery language to understand and appreciate. On second thought, maybe "classic" is too limiting. MG3.6/R for president!